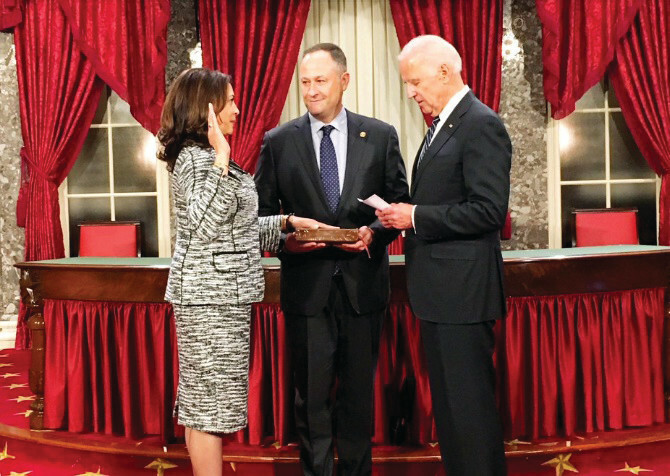 Vice President Joseph Biden administers the oath of office on Jan. 3 to Kamala Harris, the first Indian-American elected to the Senate. She swore on a Bible held by her husband Doug Emhoff, center. Sealing a historic breakthrough for Indian-Americans, five were sworn-in on Jan. 3 as members of the Congress – one of them, Kamala Harris, becoming the first to become a senator. 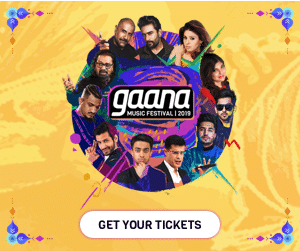 Ami Bera, who was the only Indian-American in the 435-member House of Representatives and re-elected in the November elections, was joined by the four others, increasing the Indian-American contingent to five members in the Congress. All five are Democrats and three of them – Harris, Bera and Representative Ro Khanna – are from California. The other two Representatives are Raja Krishnamoorthi from Illinois and Pramila Jayapal from Washington state. Harris, whose mother was from Chennai and father from Jamaica, has a dual identity as both an Indian-American and an African-American. Vice President Joseph Biden administered her the oath of office which she swore on a Bible copy held by her husband Doug Emhoff. Afterwards her family and friends gathered around the couple in celebration. Two of them were dressed in saris, although Harris wore a two-piece western outfit in blue. In 1956, Democrat Dalip Singh Saund became the first Indian-American elected to Congress. Forty-eight years later, Republican Piyush Bobby Jindal was elected to the House in 2004 and re-elected in 2006. But in 2007 he was elected governor of Louisiana and left Congress. After a five-year gap for Indian-Americans, Bera was elected to Congress in 2012. Republicans have the majority in both chambers. In the House of Representatives, they have 241 seats to Democrats’ 194 and Republicans control the Senate with 52 seats to the Democrats’ 46 with two Independents allied with them. The opening of the new session of Congress was overshadowed by the Republican Representatives’ decision on Jan. 2 to restrict the independence of the ethics monitors. Faced with a firestorm of criticism led by their own party’s President-elect Donald Trump, they backed down on Jan. 3 and agreed to not make any changes to the Office of Congressional Ethics, which was set up in 2008 following corruption scandals that ended with three members of Congress ending in jail.